Help! How do I boost my home's street appeal? 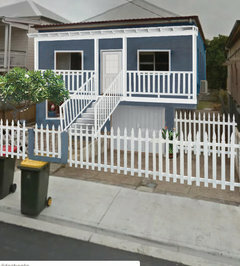 What would you do to improve the street appeal of this house? 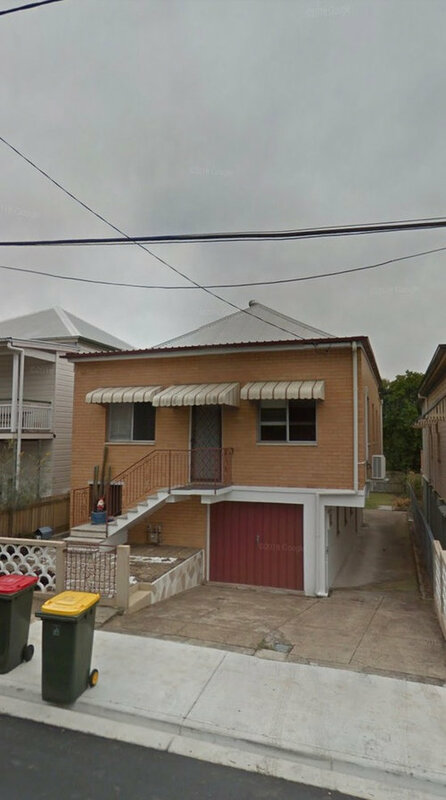 It’s a fully bricked in Queenslander that cannot he unbricked. Change the awnings for something that looks better. 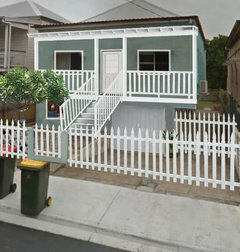 Add a verandah right across the front. There is so much wrong with this elevation including materials, proportions, colours and landscaping it will be a challenge. Somebody without any understanding of design, proportion and architecture is responsible for this "renovation" and unfortunately it will take a lot of money to undo it. A minor cheap/quick fix will not make a substantial improvement. 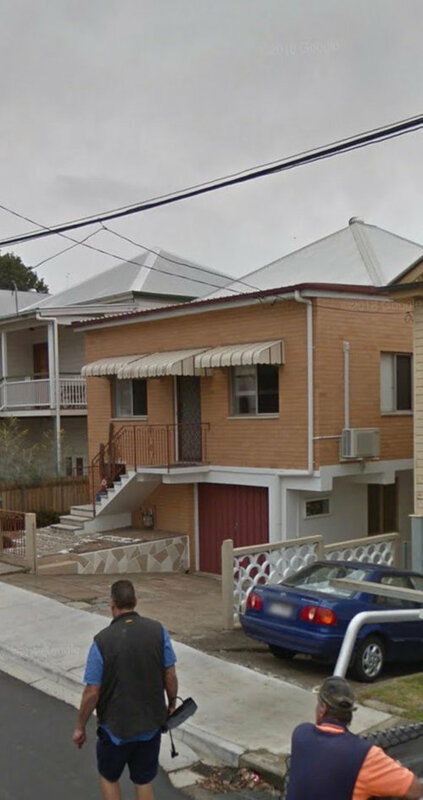 It is a classic case of somebody tring to change the style of a building (in this case a classic Queensland weatherboard) to something completely different and failing. How many tens of thousands of dollars are you prepared to spend? 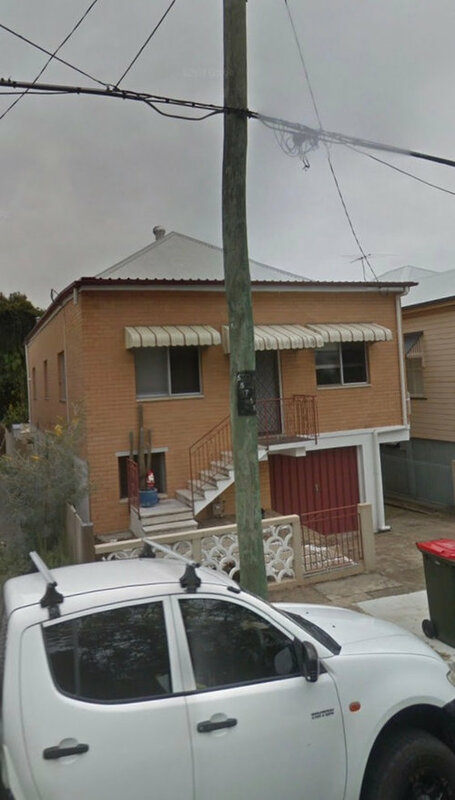 If it less than $10K, I would give up on the house, remove the front concrete and establish some bushy landscaping to soften the harshness of the facade. One of the world's most famous architects, Frank Lloyd Wright, once said " A doctor can bury his mistakes, but an architect can only advise his clients to plant vines". Even though an architect was not involved it doesn't stop you planting! This is one case where I would paint the bricks, white or pale soft grey, black gutter, black or black and white stripped awnings, black railings Black garage door. Keep any existing walls. Plant up your front garden. 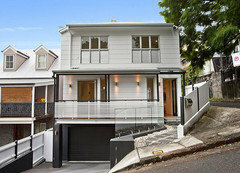 Your house will still have charm and street appeal. Have a look at renovatingaworkerscottage on Instagram. 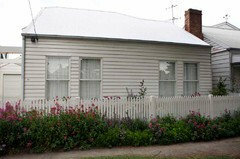 The frontage of their 1920s Queenslander cottage was similar to yours with a built in verandah and awnings. You do have a few more challenges but inspiration is good. This does not help, but does anybody else see the inquisitive face in this home. The home is also wondering why it looks like it does. I was going to write exactly what Siriuskey wrote! I think there's a good chance you can really add some charm. Honestly, I think it can be saved :) Have 2 awnings, not 3, maybe some window boxes - aim for cute. Dreamer - I think it looks like it has a monobrow at the moment ! The next door neighbour’s house looks as though it has the same ‘bones’. I would copy what they have done and then make ‘it yours’ with a paint colour to your liking. 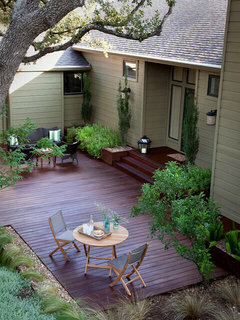 Troll the neighbourhood to get an idea for a suitable colour scheme then add specimen tree(s) and planting. All the best. Extend the veranda along the entire front, remove awnings, add a bullnose roof over veranda, paint the house, detailed balustrade, picket fence and gardens. I'm an amateur , but when I read $10k starting point , I rolled my eyes . Sure , you can spend whatever you like , and the more you spend , the more you can change , BUT here's what I would do -- go BOLD . Buy 3 or 4 x 400mm to 600mm pots in bright red , plant them with a variety of leafy and cactus type plants . Replant or biff that cactus from halfway up the steps -- I understand they were tryingwhat or you to do , but it doesn't quite work -- maybe a smaller pot with a lower plant or 2 , but bright red pot , not nothing blue . Then ( at least to complete step 1 ) , buy at least 10 litres of bright red , and a couple of brushes . Paint the front gate . 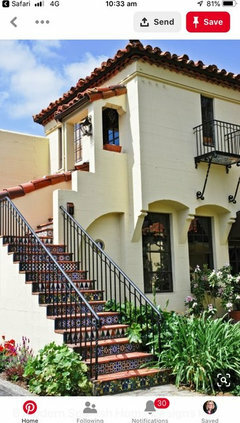 Oh , and the step railings . And while the pail is open , do the gutters , the awnings , the screen door , the window sills , the front gate , the garage door . Sure , some of the styles are dated , and its not going to add $200k to the value , but it will cost around $1000 and a couple of days , and will look way more than a $1000 improvement . Looking at the photos you need to enhance the good features that are currently there and disguise the ones that you don’t want to see. Paint the down pipe the same colour as the bricks but only the part that is on the bricks. 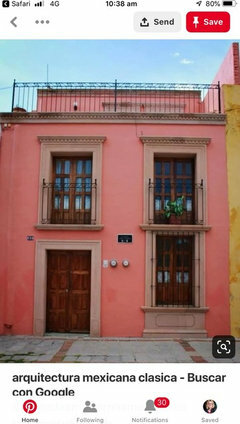 The style reminds me of a modern Mexican look so I would enhance those features around the doors and windows. Consider taking the awnings off both the windows but leave the one above the door and enhance the door and window surrounds -look for ideas on Houzz and Pinterest - I have included a few photos just as an idea. 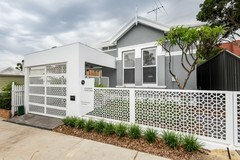 Consider using a similar mosaic that is along the wall to the garage between each step. Once you decide what you want to do I would use some of your budget to get a colourist/designer come out pick the exact colours you for you. Also when have your style and colours then you can do some landscaping to really tie everything in - pots at each side of the stairs would look good and also hide the gas metre under the stairs. I like the Mexican idea and tones , well maybe not the pink haha ! Looking at the pics again , you know what I really dislike ? The veranda over the door , I reckon if you lifted it 100-150mm so the bottom was level with the 2 over the windows , it wouldn't look nearly as disjointed . 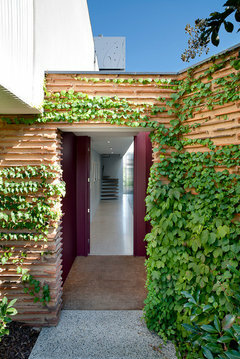 I think the task of transforming homes like these is an exciting challenge! If your budget is not huge then timber trimmings and paint can make a huge difference here. You could paint the brick, or better still clad it with weatherboard to soften the house, but if the budget does not allow the whole house to be clad just do the front and go around the corners by about a meter and then paint the bricks at the sides and back to match. You definitely need a verandah across the front, with the steps centred and going straight down to meet the gate - this will transform the facade and is worth spending the money on. If you dont want to change the windows consider framing them with timber to make them look larger and replace the front door with something nicer, luckily your door is centred with same size windows either side. Id suggest replacing the fence with a picket fence and matching gates to hide the concrete driveway and then screen off the long side driveway and camouflage the overhang with a picket gate to match. 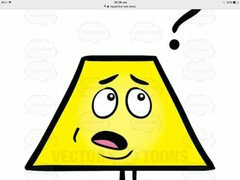 You need some plants but your front yard is not large so a single, low height feature tree with mulch or pebbles instead of lawn would look wonderful plus a couple of strategically placed pots. Great ideas there littlethommo2. The brick work is just so wrong for the building it would do wonders to clad over the façade, and replace those windows... Best of luck. Need help for giving this house a more interesting street appeal. How do I update and boost my street appeal?